Matching your shipping rates with ours isn't necessary, but we'd definitely recommend it. It means you'll have complete control over what you charge your customers for shipping, and since these prices are based on our rates you'll never be out of pocket. Sign in to your EKM store and head to the Features tab. You'll see the features you installed when integrating your store with Inkthreadable. Click on the Product Attributes feature. Check the box next to 'Enable Product Weight' and click Save. 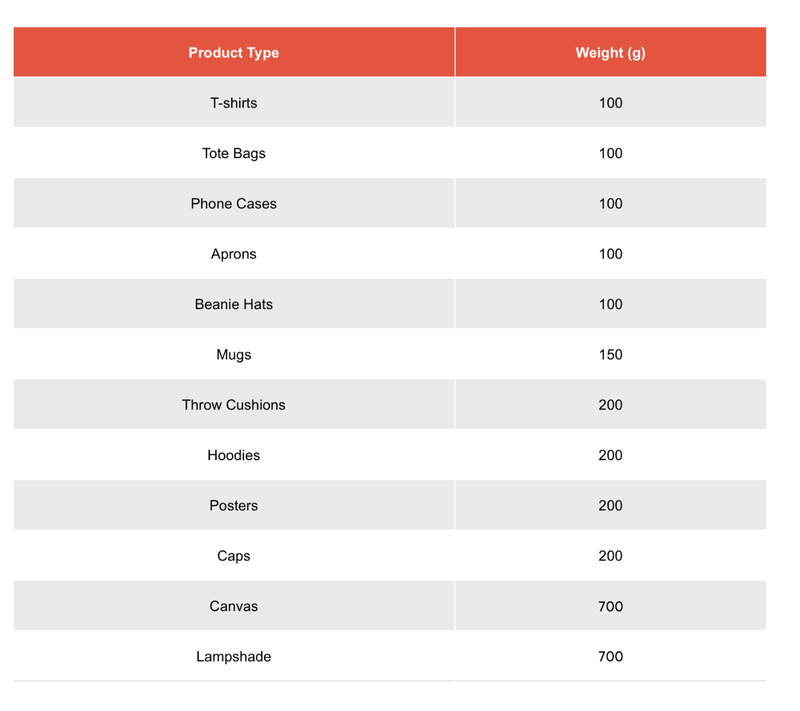 This will add the option to assign shipping costs to orders based on total weight, which is how we ship products from Inkthreadable. With this done, head to the Settings tab and click Delivery Methods. By default your store will have a group set up. We're going to create three groups like this one based on the three 'zones' that affect shipping costs: United Kingdom, Europe and Rest of the World. If you don't need all of these zones (for example you're based in the UK and don't want to sell abroad) then you only need to set up one zone. This guide will match your shipping costs with ours, but if you want to deviate from the guide to do what's best for your store then there's absolutely nothing stopping you. Likewise, you don't need to match our shipping costs exactly. If you want to offer free shipping for certain zones, or you want to round up (or round down) your shipping costs so they're not seemingly random prices for your customers then feel free. We also offer three shipping methods to each zone: Regular, Recorded and Courier. Again, you don't need to set up rates for these shipping methods if you don't plan on using them all. You could skip offering the Courier service, for example, by simply not setting any rates for it. Click the down arrow beside your default zone, click the edit icon beside the default delivery method and edit the default details in this delivery method. 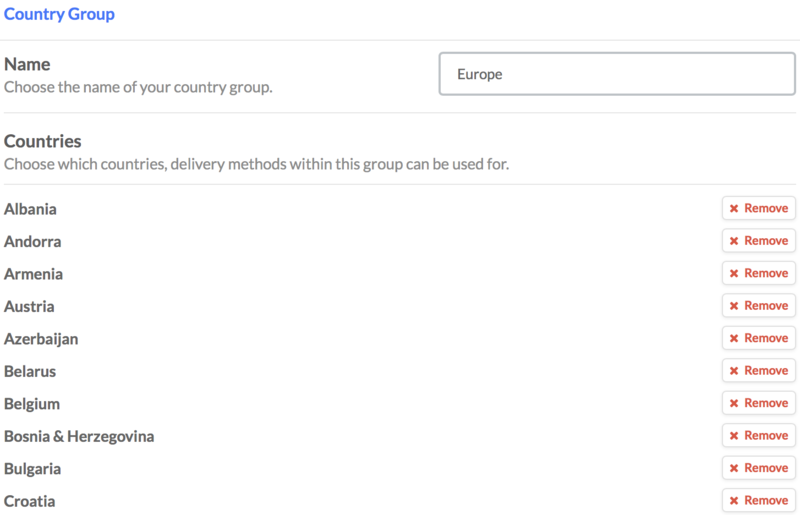 Country: The country (or group of countries) that this delivery method will be used for. Name: This will always either be [Country/Group] Regular, Recorded or Courier (for example UK Recorded or Europe Courier). These names are required since our integration looks out for these specific keywords when assigning the shipping method as the order comes through to your linked Inkthreadable account. Display Name: You can leave this blank if you don't want your customers to know the exact courier service used. Otherwise it's Royal Mail 1st Class for Regular, Royal Mail Signed For for Recorded, and DPD for Courier. Description: You can leave this blank, but if you do want to include additional details then the Recorded and Courier services require a signature on delivery. Price: The base price for this delivery method. We'll go into prices in detail below. Tax Rate: This will depend on how you've set up taxes for your store. We can't legally give advice about tax, but typically all prices include VAT as standard when integrating to keep things simple. Select which option which best applies to you. We'll set up the first delivery method for the UK first. Change the Country to United Kingdom, the Name to UK Regular and either leave the Display Name blank or enter Royal Mail 1st Class. You can leave the Description field blank. The Price is £1.35 (since this is the lowest shipping cost for a parcel in the UK, we'll add more expensive rates in a moment) and select your Tax Rate. Not every parcel shipped with the UK Regular method will cost £1.50. Next we'll add weight restrictions and additional costs based on the total weight of the order. Scroll down the page a little and you'll see the weight restrictions heading. Check this box to enable weight restrictions. Please note: If you don't see this option available you'll need to head back to the Product Attributes feature and check the box next to 'Enable Product Weight'. With this in mind, let's assign weight restrictions and additional costs. For both the Regular and Recorded shipping methods the minimum weight is 0.0kg and the maximum is 0.6kg. Royal Mail can ship heavier parcels than this, but it's actually cheaper to ship them through our Courier service (DPD) to UK and Europe, and it's a guaranteed next day delivery service for parcels shipped within the UK. Since this delivery method is UK Regular, enter 0.0kg as the minimum and 0.6kg as the maximum weight values. This will force any orders weighing more than this to use the UK Courier option, once we've set that delivery method up. Scroll down a little further and you'll see the additional costs section. To cover all bases, first create a weight range from 0.0kg to 0.1kg and allocate no additional costs. Then create a second row with the weight range from 0.11kg to 0.3kg with an additional cost 0f £1.98. This additional cost comes from the formula above. The shipping cost for UK Regular between these weight values is £3.48, the base cost (that you entered earlier) is £1.50, the price for a parcel shipped UK Regular at a maximum of 0.1kg. Finally, add a final row with a weight range of 0.31kg to 0.6kg with an additional cost of £3.96. (£5.46 — £1.50). With this complete your shipping costs for UK Regular are now set up. The next step is to repeat this process for the UK Recorded and UK Courier shipping methods. 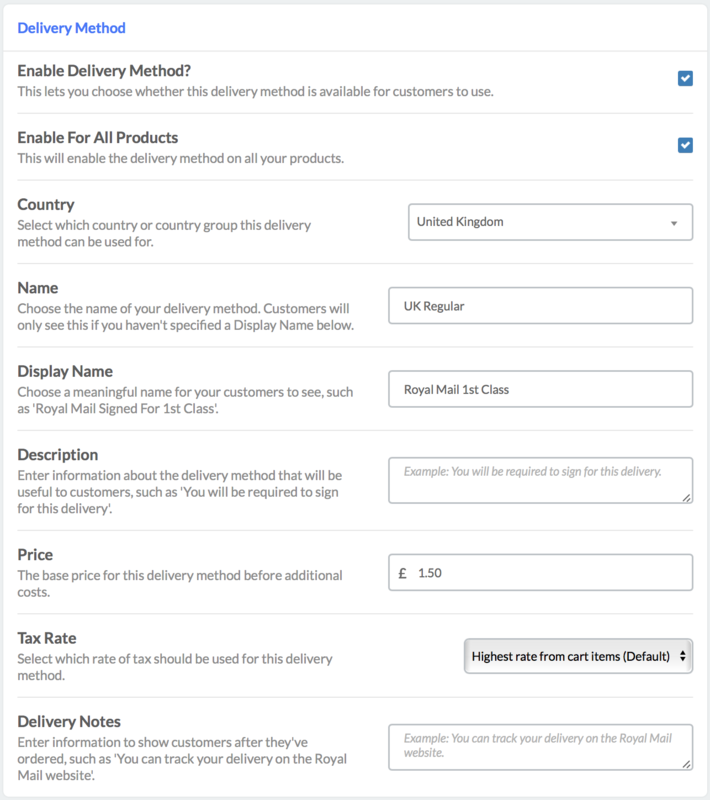 Head back to the Delivery page and click the copy icon beside the UK Regular shipping method you've just created. Change the Name to UK Recorded, leave the Country as UK and click Copy. Click the edit icon next to this new delivery method. If you entered Royal Mail 1st Class as the Display Name for the UK Regular method then this will have copied over. Our UK Recorded shipping method uses Royal Mail Signed For, so update this field if you need to. The base Price for this shipping method is £2.88 - update this too. When you scroll down, weight restrictions should be enabled with the same minimum and maximum weight allowances. The additional costs should also be populated with the same information as the UK Regular shipping method. Everything here can stay the same but for the additional costs themselves. The first row will stay at £0.00. The second row needs an additional cost of £2.48 and the third row should be £3.82. Click the Save Changes button. You've now set up your UK Regular and UK Recorded shipping methods, the final one is UK Courier. This is a much simpler method to set up since there is only one additional cost. Head back to the Delivery page and click the Add Delivery Method button. The Country is UK, the Name is UK Courier and (if you want to include it) the Display Name is DPD. The Price is £4.98. Scroll down and enable weight based shipping with a minimum weight of 0.0kg and a maximum of 30.0kg. There is one additional costs for this this delivery method. First create a weight range from 0.0kg to 0.6kg and allocate no additional costs. Then create a second row with the weight range from 0.61kg to 30kg with an additional cost of £3.02. You'll notice that this means some parcels are actually cheaper to ship by Courier than by the Regular or Recorded methods. This isn't a mistake - our Courier service can ship parcels at 600g or less for £4.98. This is a fully tracked, next day shipping service available for parcels shipped in the UK only. Click the Save Changes button. Your shipping methods for the UK are now set up! The difficulty with this zone is assigning which countries are included in the group. It's not difficult as such, just tedious. You'll need to manually enter each country. The good news is that you'll only need to do this once. Head to the Delivery page. Below the shipping methods set up for the UK you'll see the Country Groups heading. Click the arrow and the Add Country Group button. The Name of the group will be Europe. And now we need to add each country in Europe manually. Albania, Andorra, Armenia, Austria, Azerbaijan, Belarus, Belgium, Bosnia & Herzegovina, Bulgaria, Croatia, Cyprus, Czech Republic, Denmark, Estonia, Faroe Islands, Finland, France, Georgia, Germany, Gibraltar, Greece, Greenland, Hungary, Holy See (Vatican City State), Iceland, Ireland, Italy, Jersey, Kazakhstan, Kyrgyzstan, Latvia, Liechtenstein, Lithuania, Luxembourg, Macedonia (The Former Yugoslav Republic Of), Malta, Moldova (Republic Of), Monaco, Montenegro, Netherlands, Norway, Poland, Portugal, Romania, Russian Federation, San Marino, Serbia, Slovakia, Slovenia, Spain, Sweden, Switzerland, Tajikistan, Turkey, Turkmenistan, Ukraine, Uzbekistan. Please note: not everyone agrees on which countries are included in Europe and which aren't. It's a difficult thing to define. This is the list that Inkthreadable uses. 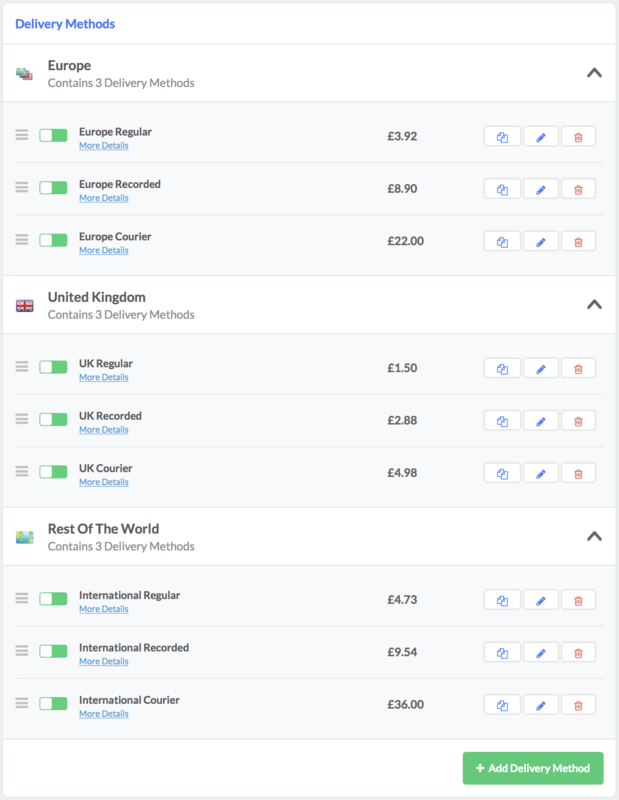 Deviating from this by adding/removing your own countries will change the amount your EKM store charges customers for shipping to those countries but it won't have any impact on what Inkthreadable charges you for shipping the order. Make sure you click the Save Changes button. If you don't you'll have to do it all again! The majority of setting up shipping methods for Europe and International shipping is the same as for the UK. Head to the Delivery page and click Add Delivery Method. Select either Europe or Rest of the World as the Country, enter either Europe/International Regular, Recorded or Courier as the Name and either Royal Mail 1st Class, Royal Mail Signed For or DPD as the Display Name, if you're using this field. There's a list of prices and additional costs below, so use this to enter the correct price in the Price field. Enable weight based shipping and enter a minimum of 0.0kg and maximum of 0.6 for Regular or Recorded shipping methods, or 0.0kg and 30.0kg for Courier. Remember: Courier shipping methods need to additional cost fields. Use these prices when creating shipping methods for your Europe and International parcels.